This is the first of two lists of the books I read this year that I most enjoyed. This one focuses on books released this year; the other will focus around books that I encountered for the first time in 2011 that first entered the world in preceding years. I wrote about Vanessa Veselka’s Zazen and Justin Taylor’s The Gospel of Anarchy for The Contextual Life’s seasonal gift guide, which I urge you to check out. Short version: they’re two novels that feel deeply relevant in today’s protest-heavy culture, and they make a fine double bill. If you’re a reader of (to use one example) Brian Wood’s fantastic comic DMZ, you know just how effective and evocative a ruined New York City can be. 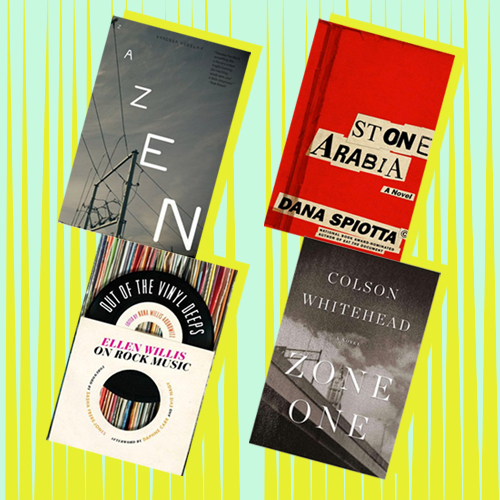 Colson Whitehead’s Zone One follows a small group of survivors attempting to rebuild part of New York following a virus that has, for all intents and purposes, turned much of the country catatonic or full-on undead. But it’s as much about reinvention, memory, and optimism (whether warranted or not). Nathan Larson’s The Dewey Decimal System also places its protagonist in a decimated New York City, fighting off damaged memories and unraveling a mystery that itself involves fallout from other broken cities. There’s been a lot written about Ellen Willis’s Out of the Vinyl Deeps this year, and for good reason: even after decades, Willis’s take on music and the themes and issues that power and emerge from it resonates. This is smart criticism that feels just as relevant now as it did then. And the essays collected in Geoff Dyer’s Otherwise Known as the Human Condition cover an expansive range of topics, from fashion to jazz to the joys of Doughnut Plant. It doesn’t hurt that each of these books serve as fine introductions to their respective authors. I can’t write with any real objectivity about Daphne Carr’s Pretty Hate Machine — the author’s an old friend, and I’m thanked in the book’s acknowledgements section. But I can’t not include it here in some capacity: it’s at once a smart piece of culture writing, a sociological look at the Rust Belt, and a fascinating oral history of a particular place and time.